Will You Keep Supporting The Millers Home And Away? Rotherham United are just a month into their latest foray into the Championship and there is nowhere in the rule book that ever said it was going to be easy. We’ve already got more points that our the last time we ended an August in this league (in 2015) when we had five points to today’s six – although, to be fair, we have played a game more. On a local radio ‘phone-in this week I heard a Millers fan ask when was the last time we won an away game in the Championship. Well the answer to that is 9th April 2016 away at MK Dons when goals from Matt Derbyshire, Leon Best (penalty), Kirk Broadfoot and Richie Smallwood made it a four-nil win. I’ve also heard people saying that we should have got something from the game away at Wigan on Saturday – well, in my humble opinion, the way we set-up we deserved exactly what we got. But that doesn’t mean to say I think we’ll not win an away game this season. There’s still a lot of the season to go and it’s more than possible that we’ll get a win away from home. I thought we were awful away at Brentford, but never gave in, and not good at Wigan on Saturday, again playing better for the last fifteen minutes or so, but against Leeds United at Elland Road I think we had a very good first half and an OK second half whilst we gave Everton (and they had some first team players in) a game. Although, I have to say, I also think it’s going to be our home form that will keep us in the Championship this season. But if we aren’t playing so well (though our performance at Everton was very good) people might stop firstly going to away games and then, if it doesn’t get better, will stop going to the New York Stadium. Which means the atmosphere will falter and that will be a real shame. 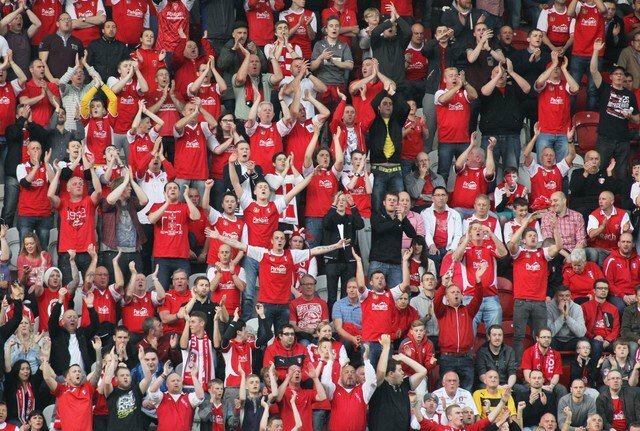 I’m a home season ticket holder who goes to most of the away games – up to now I’ve seen every game the Millers have played this season since the friendly against Cardiff City. I’ve seen great performances, I’ve seen indifferent performances and I’ve seen performances that have had me scratching my head. But, to be truthful, it’s been like that for the fifty or so years I’ve been watching! It comes back to the football ‘chicken and egg scenario’ do the fans get the players going or do the players get the fans going? Yes, I’ll still keep following the team but it’s not a cheap hobby to have and I can quite understand those who won’t.